Betty and her handmade flowered and painted jumpers are a familiar sight around Ashburn House in Gladesville, along with her dance moves! Right from her early school years Betty was a talented artist. She was a photographer for Ray Wood Photographers, and has worked at many weddings and special functions for guests. Her family have some lovely framed pictures that were done by her. In fact, three of them are hanging in her room now. Betty was born in Ashfield on Australia Day, 1928 to parents George and Dorothy Lawrence as one of six, and after attending Haberfield Demonstration School and Burwood Girls High, the family moved to Five Dock. She began nursing at Balmain Hospital, but unfortunately had to give it up to care for her Mum who had suffered a bad fall. She married her first husband in 1947 and they had one daughter, Suzanne. 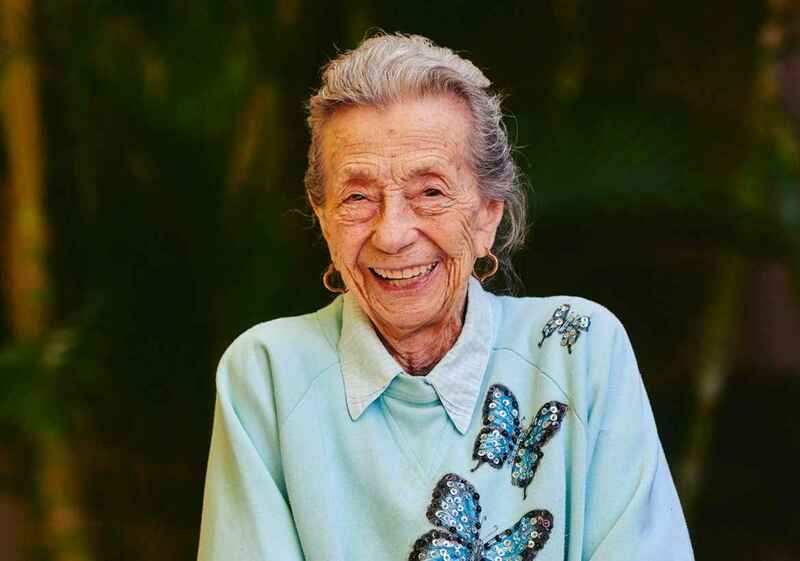 Betty worked as a receptionist for medical specialists on Macquarie St, Sydney for years. After being divorced for many years, Betty married Terrence West in 1974 and moved to Newcastle where he had a smash repair business. Betty continued painting and doing craft which she enjoyed greatly and was very good at. The lovely flowered and painted tops Betty wears today were created by her. They enjoyed many overseas trips and cruises. Regularly, Betty drove to Sydney to care for her mother and one of her brothers, Barton, who suffered ill health for years. After Terrence passed away in February 2016, Betty moved back to Sydney into Ashburn House and is now close to her family. Betty has two grandchildren and four great grandchildren, whom she delights in spending time with when they come to visit. Betty likes to keep herself busy, and is always the first one up to dance when there are concerts and music. Find out more about Ashburn House in Gladesville.